It’s hard to believe local maker, art, and creative space Fort Houston is already turning six, but it’s no surprise that they’re going all out once more with a stacked celebration at the new Lindell Ave complex where they relocated last year. The 6th Birthday Bonanza tonight, May 12, comes in two parts- first, a late afternoon to evening concert featuring a stacked lineup of local favorites JEFF the Brotherhood, Diarrhea Planet, TWEN, Katie Schecter, Dan Luke and the Raid, and Brooklyn’s THICK, which kicks off at 5 p.m., and features DJ sets from Hustle & Bump between bands, plus GIF and photo booths, art from Fort Houston’s Fabrication Team, a variety of food trucks, and more. Then, at 11 p.m. and running late into the night, there’s an after party with Sparkle City DJs, a light show, art, and free booze and pizza, from Good People and Two Boots, respectively. You can snag tickets separately or together (we’d suggest together if you’re planning on the concert part, cause you know you’ll want to hang around in indulge), but whichever way you choose to partake, this is going to one of the most fun local-geared events of the whole weekend, and a pretty affordable one to catch some of the absolute best garage, indie, psych, and punk acts in town. Preview the whole lineup below! 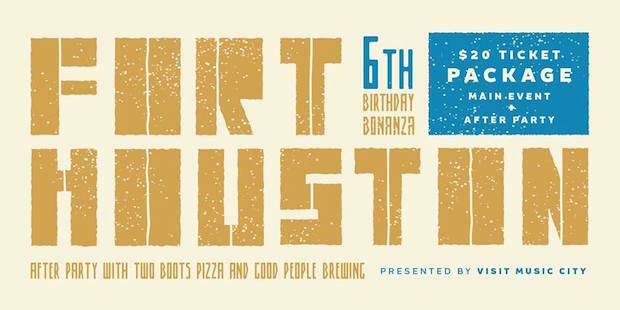 Jeff the Brotherhood, Diarrhea Planet, Twen, Thick, Katie Schecter, and Dan Luke & the Raid will perform today, May 12 at Fort Houston’s 6th Birthday Bonanza. The outdoor concert is all ages, begins at 6 p.m., and tickets are available for $15-20. The after party, featuring DJs from Sparkle City Disco, is 21+, begins at 11 p.m., and tickets are available for $10-20. Catch Eagles Of Death Metal & Jesika Von Rabbit Tonight @ Cannery Ballroom!